Best Landscape Edging ~ Keep your Lawn Edging or ​Landscape Border Beautiful! Innovating from the Ground Up! Lawn Edging at its Best! Alpha Edge® durable corrugated sidewall construction and t-shape flange allows for easy and secure installation. 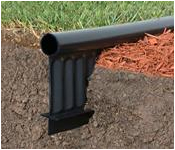 ​The patent design eliminates the need of a garden edger. Its one time installation inhibits grass from growing onto walkways and concrete driveways. Our products are efficient and sturdy construction, making installation for any homeowner or contractor quick and easy!